Archbishop of Canterbury, Doctor of the Church; born at Aosta a Burgundian town on the confines of Lombardy, died 21 April, 1109. His father, Gundulf, was a Lombard who had become a citizen of Aosta, and his mother, Ermenberga, came of an old Burgundian family. Like many other saints, Anselm learnt the first lessons of piety from his mother, and at a very early age he was fired with the love of learning. In after life he still cherished the memories of childhood, and his biographer, Eadmer, has preserved some incidents which he had learnt from the saint's own lips. The child had heard his mother speak of God, Who dwelt on high ruling all things. Living in the mountains, he thought that Heaven must be on their lofty summits. "And while he often revolved these matters in his mind, it chanced that one night he saw in a vision that he must go up to the summit of the mountain and hasten to the court of God, the great King. But before he began to ascend the mountain, he saw in the plain through which he had passed to its foot, women, who were the King's handmaidens, reaping the corn; but they were doing this very negligently and slothfully. Then, grieving for their sloth, and rebuking them, he bethought him that he would accuse them before their Lord and King. Thereafter, having climbed the mountain he entered the royal court. There he found the King with only his cupbearer. For it seemed that, as it was now Autumn, the King had sent his household to gather the harvest. As the boy entered he was called by the Master, and drawing nigh he sat at his feet. Then with cheery kindliness he was asked who and whence he was and what he was seeking. To these questions he made answer as well as he knew. Then at the Master's command some moist white bread was brought him by the cupbearer and he feasted thereon in his presence, wherefore when morning came and he brought to mind the things he had seen, as a simpler and innocent child he believed that he had truly been fed in heaven with the bread of the Lord, and this he publicly affirmed in the presence of others". (Eadmer, Life of St. Anselm, I, i.) Eadmer adds that the boy was beloved by all and made rapid progress in learning. Before he was fifteen he sought admission to a monastery. But the abbot, fearing the father's displeasure, refused him. The boy then made a strange prayer. He asked for an illness, thinking this would move the monks to yield to his wishes. The illness came but his admission to the monastery was still denied him. None the less he determined to gain his end at some future date. But ere long he was drawn away by the pleasures of youth and lost his first ardour and his love of learning. His love for his mother in some measure restrained him. But on her death it seemed that his anchor was lost, and he was at the mercy of the waves. At this time his father treated him with great harshness; so much so that he resolved to leave his home. Taking a single companion, he set out on foot to cross Mont Cenis. At one time he was fainting with hunger and was fain to refresh his strength with snow, when the servant found that some bread was still left in the baggage, and Anselm regained strength and continued the journey. After passing nearly three years in Burgundy and France, he came into Normandy and tarried for a while at Avranches before finding his home at the Abbey of Bec, then made illustrious by Lanfranc's learning. Anselm profited so well by the lessons of this master that he became his most familiar disciple and shared in the work of teaching. After spending some time in this labour, he began to think that his toil would have more merit if he took the monastic habit. But at first he felt some reluctance to enter the Abbey of Bec, where he would be overshadowed by Lanfranc. After a time, however, he saw that it would profit him to remain where he would be surpassed by others. His father was now dead, having ended his days in the monastic habit, and Anselm had some thought of living on his patrimony and relieving the needy. The life of a hermit also presented itself to him as a third alternative. Anxious to act with prudence he first asked the advice of Lanfranc, who referred the matter to the Archbishop of Rouen. This prelate decided in favour of the monastic life, and Anselm became a monk in the Abbey of Bec. This was in 1060. His life as a simple monk lasted for three years, for in 1063 Lanfranc was appointed Abbot of Caen, and Anselm was elected to succeed him as Prior. There is some doubt as to the date of this appointment. But Canon Poree points out that Anselm, writing at the time of his election as Archbishop (1093), says that he had then lived thirty three years in the monastic habit, three years as a monk without preferment, fifteen as prior, and fifteen as abbot (Letters of Anselm, III, vii). This is confirmed by an entry in the chronicle of the Abbey of Bec, which was compiled not later than 1136. Here it is recorded that Anselm died in 1109, in the forty-ninth year of his monastic life and the seventy-sixth of his age, having been three years a simple monk; fifteen, prior; fifteen, abbot; and sixteen archbishop (Poree, Histoire de l'abbaye de Bec, III, 173). At first his promotion to the office vacated by Lanfranc gave offence to some of the other monks who considered they had a better claim than the young stranger. But Anselm overcame their opposition by gentleness, and ere long had won their affection and obedience. To the duties of prior he added those of teacher. It was likewise during this period that he composed some of his philosophical and theological works, notably, the "Monologium" and the "Proslogium". Besides giving good counsel to the monks under his care, he found time to comfort others by his letters. Remembering his attraction for the solitude of a hermitage we can hardly wonder that he felt oppressed by this busy life and longed to lay aside his office and give himself up to the delights of contemplation. But the Archbishop of Rouen bade him retain his office and prepare for yet greater burdens. This advice was prophetic, for in 1078, on the death of Herluin, founder and first Abbot of Bec Anselm was elected to succeed him. It was with difficulty that the monks overcame his reluctance to accept the office. His biographer, Eadmer, gives us a picture of a strange scene. The Abbot-elect fell prostrate before the brethren and with tears besought them not to lay this burden on him, while they prostrated themselves and earnestly begged him to accept the office. His election at once brought Anselm into relations with England, where the Norman abbey had several possessions. In the first year of his office, he visited Canterbury where he was welcomed by Lanfranc. "The converse of Lanfranc and Anselm", says Professor Freeman, "sets before us a remarkable and memorable pair. The lawyer, the secular scholar, met the divine and the philosopher; the ecclesiastical statesman stood face to face with the saint. The wisdom, conscientious no doubt but still hard and worldly, which could guide churches and kingdoms in troublous times was met by the boundless love which took in all God's creatures of whatever race or species" (History of the Norman Conquest, IV, 442). It is interesting to note that one of the matters discussed on this occasion related to a Saxon archbishop, Elphage (Ælfheah), who had been put to death by the Danes for refusing to pay a ransom which would impoverish his people. Lanfranc doubted his claim to the honours of a martyr since he did not die for the Faith. But Anselm solved the difficulty by saying that he who died for this lesser reason would much more be ready to die for the Faith. Moreover, Christ is truth and justice and he who dies for truth and justice dies for Christ. It was on this occasion that Anselm first met Eadmer, then a young monk of Canterbury. At the same time the saint, who in his childhood was loved by all who knew him, and who, as Prior of Bec, had won the affection of those who resisted his authority, was already gaining the hearts of Englishmen. His fame had spread far and wide, and many of the great men of the age prized his friendship and sought his counsel. Among these was William the Conqueror, who desired that Anselm might come to give him consolation on his death-bed. When Lanfranc died, William Rufus kept the See of Canterbury vacant for four years, seized its revenues, and kept the Church in England in a state of anarchy. To many the Abbot of Bec seemed to be the man best fitted for the archbishopric. The general desire was so evident that Anselm felt a reluctance to visit England lest it should appear that he was seeking the office. At length, however, he yielded to the entreaty of Hugh, Earl of Chester and came to England in 1092. Arriving in Canterbury on the eve of the Nativity of the Blessed Virgin, he was hailed by the people as their future archbishop; but he hastened away and would in no wise consent to remain for the festival. At a private interview with the King, who received him kindly, he spoke freely on the evils by which the land was made desolate. Anselm's own affairs kept him in England for some months, but when he wished to return to Bec the King objected. Meanwhile the people made no secret of their desires. With the King's permission prayers were offered in all the churches that God would move the King to deliver the Church of Canterbury by the appointment of a pastor, and at the request of the bishops Anselm drew up the form of prayer. The King fell ill early in the new year (1093), and on his sick-bed he was moved to repentance. The prelates and barons urged on him the necessity of electing an archbishop. Yielding to the manifest desire of all he named Anselm, and all joyfully concurred in the election. Anselm, however, firmly refused the honour, whereupon another scene took place still more strange than that which occurred when he was elected abbot. He was dragged by force to the King's bedside, and a pastoral staff was thrust into his closed hand; he was borne thence to the altar where the "Te Deum" was sung. There is no reason to suspect the sincerity of this resistance. Naturally drawn to contemplation, Anselm could have little liking for such an office even in a period of peace; still less could he desire it in those stormy days. He knew full well what awaited him. The King's repentance passed away with his sickness and Anselm soon saw signs of trouble. His first offence was his refusal to consent to the alienation of Church lands which the King had granted to his followers. Another difficulty arose from the King's need of money. Although his see was impoverished by the royal rapacity, the Archbishop was expected to make his majesty a free gift; and when he offered five hundred marks they were scornfully refused as insufficient. As if these trials were not enough Anselm had to bear the reproaches of some of the monks of Bec who were loath to lose him; in his letters he is at pains to show that he did not desire the office. He finally was consecrated Archbishop of Canterbury 4 December, 1093. It now remained for him to go to Rome to obtain the pallium. But here was a fresh occasion of trouble. The Antipope Clement was disputing the authority of Urban II, who had been recognized by France and Normandy. It does not appear that the English King was a partisan of the Antipope, but he wished to strengthen his own position by asserting his right to decide between the rival claimants. Hence, when Anselm asked leave to go to the Pope, the King said that no one in England should acknowledge either Pope till he, the King, had decided the matter. The Archbishop insisted on going to Pope Urban, whose authority he had already acknowledged, and, as he had told the King, this was one of the conditions on which alone he would accept the archbishopric. This grave question was referred to a council of the realm held at Rockingham in March, 1095. Here Anselm boldly asserted the authority of Urban. His speech is a memorable testimony to the doctrine of papal supremacy. It is significant that not one of the bishops could call it in question (Eadmer, Historia Novorum, lib. I). 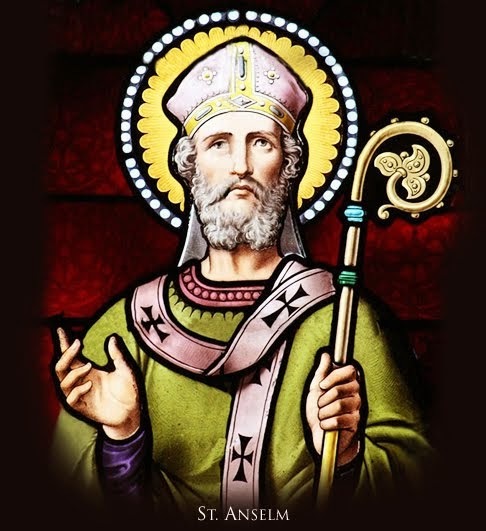 Regarding Anselm's belief on this point we may cite the frank words of Dean Hook: "Anselm was simply a papist — He believed that St. Peter was the Prince of the Apostles — that as such he was the source of all ecclesiastical authority and power; that the pope was his successor; and that consequently, to the pope was due, from the bishops and metropolitans as well as from the rest of mankind, the obedience which a spiritual suzerain has the right to expect from his vassals" [Lives of the Archbishops of Canterbury (London, 18(i0-75), II, 183]. William now sent envoys to Rome to get the pallium. They found Urban in possession and recognized him. Walter, Bishop of Albano, came back with them as legate bearing the pallium. The King publicly acknowledged the authority of Urban, and at first endeavoured to get Anselm deposed by the legate. Eventually a reconciliation was occasioned by the royal difficulties in Wales and in the north. The King and the Archbishop met in peace. Anselm would not take the pallium from the King's hand; but in a solemn service at Canterbury on 10 June, 1095 it was laid on the altar by the legate, whence Anselm took it. Fresh trouble arose in 1097. On returning from his ineffectual Welsh campaign William brought a charge against the Archbishop in regard to the contingent he had furnished and required him to meet this charge in the King's court. Anselm declined and asked leave to go to Rome. This was refused, but after a meeting at Winchester Anselm was told to be ready to sail in ten days. On parting with the King, the Archbishop gave him his blessing, which William received with bowed head. At St. Omer's Anselm confirmed a multitude of persons. Christmas was spent at Cluny, and the rest of the winter at Lyons. In the spring he resumed his journey and crossed Mont Cenis with two companions all travelling as simple monks. At the monasteries on their way they were frequently asked for news of Anselm. On his arrival in Rome he was treated with great honour by the Pope. His case was considered and laid before the council, but nothing could be done beyond sending a letter of remonstrance to William. During his stay in Italy Anselm enjoyed the hospitality of the Abbot of Telese, and passed the summer in a mountain village belonging to this monastery. Here he finished his work, "Cur Deus Homo", which he had begun in England. In October, 1098, Urban held a council at Bari to deal with the difficulties raised by the Greeks in regard to the procession of the Holy Ghost. Here Anselm was called by the Pope to a place of honour and bidden to take the chief part in the discussion. His arguments were afterwards committed to writing in his treatise on this subject. His own case was also brought before this council, which would have excommunicated William but for Anselm's intercession. Both he and his companions now desired to return to Lyons, but were bidden to await the action of another council to be held in the Lateran at Easter. Here Anselm heard the canons passed against Investitures, and the decree of excommunication against the offenders. This incident had a deep influence on his career in England. While still staying in the neighbourhood of Lyons, Anselm heard of the tragic death of William. Soon messages from the new king and chief men of the land summoned him to England. Landing at Dover, he hastened to King Henry at Salisbury. He was kindly received, but the question of Investitures was at once raised in an acute form. Henry required the Archbishop himself to receive a fresh investiture. Anselm alleged the decrees of the recent Roman council and declared that he had no choice in the matter. The difficulty was postponed, as the King decided to send to Rome to ask for a special exemption. Meanwhile, Anselm was able to render the King two signal services. He helped to remove the obstacle in the way of his marriage with Edith, the heiress of the Saxon kings. The daughter of St. Margaret had sought shelter in a convent, where she had worn the veil, but had taken no vows. It was thought by some that this was a bar to marriage, but Anselm had the case considered in a council at Lambeth where the royal maiden's liberty was fully established, and the Archbishop himself gave his blessing to the marriage. Moreover, when Robert landed at Portsmouth and many of the Norman nobles were wavering in their allegiance, it was Anselm who turned the tide in favour of Henry. In the meantime Pope Paschal had refused the King's request for an exemption from the Lateran decrees, yet Henry persisted in his resolution to compel Anselm to accept investiture at his hands. The revolt of Robert de Bellesme put off the threatened rupture. To gain time the King sent another embassy to Rome. On its return, Anselm was once more required to receive investiture. The Pope's letter was not made public, but it was reported to be of the same tenor as his previous reply. The envoys now gave out that the Pope had orally consented to the King's request, but could not say so in writing for fear of offending other sovereigns. Friends of Anselm who had been at Rome, disputed this assertion. In this crisis it was agreed to send to Rome again; meanwhile the King would continue to invest bishops and abbots, but Anselm should not be required to consecrate them. During this interval Anselm held a council at Westminster. Here stringent canons were passed against the evils of the age. In spite of the compromise about investiture, Anselm was required to consecrate bishops invested by the King, but he firmly refused, and it soon became evident that his firmness was taking effect. Bishops gave back the staff they had received at the royal hands, or refused to be consecrated by another in defiance of Anselm. When the Pope's answer arrived, repudiating the story of the envoys, the King asked Anselm to go to Rome himself. Though he could not support the royal request he was willing to lay the facts before the Pope. With this understanding he once more betook himself to Rome. The request was again refused, but Henry was not excommunicated. Understanding that Henry did not wish to receive him in England, Anselm interrupted his homeward journey at Lyons. In this city he received a letter from the Pope informing him of the excommunication of the counsellors who had advised the King to insist on investitures, but not decreeing anything about the King. Anselm resumed his journey, and on the way he heard of the illness of Henry's sister, Adela of Blois. He turned aside to visit her and on her recovery informed her that he was returning to England to excommunicate her brother. She at once exerted herself to bring about a meeting between Anselm and Henry, in July, 1105. But though a reconciliation was effected, and Anselm was urged to return to England, the claim to invest was not relinquished, and recourse had again to be made to Rome. A papal letter authorizing Anselm to absolve from censures incurred by breaking the laws against investitures healed past offences but made no provision for the future. At length, in a council held in London in 1107, the question found a solution. The King relinquished the claim to invest bishops and abbots, while the Church allowed the prelates to do homage for their temporal possessions. Lingard and other writers consider this a triumph for the King, saying that he had the substance and abandoned a mere form. But it was for no mere form that this long war had been waged. The rite used in the investiture was the symbol of a real power claimed by the English kings, and now at last abandoned. The victory rested with the Archbishop, and as Schwane says (Kirchenlexicon, s.v.) it prepared the way for the later solution of the same controversy in Germany. Anselm was allowed to end his days in peace. In the two years that remained he continued his pastoral labours and composed the last of his writings. Eadmer, the faithful chronicler of these contentions, gives a pleasing picture of his peaceful death. The dream of his childhood was come true; he was to climb the mountain and taste the bread of Heaven. Anselm's chief achievement in philosophy was the ontological argument for the existence of God put forth in his "Proslogium". Starting from the notion that God is "that than which nothing greater can be thought", he argues that what exists in reality is greater than that which is only in the mind; wherefore, since "God is that than which nothing greater can be thought", He exists in reality. The validity of the argument was disputed at the outset by a monk named Gaunilo, who wrote a criticism on it to which Anselm replied. Eadmer tells a curious story about St. Anselm's anxiety while he was trying to work out this argument. He could think of nothing else for days together. And when at last he saw it clearly, he was filled with joy, and made haste to commit it to writing. The waxen tablets were given in charge to one of the monks but when they were wanted they were missing. Anselm managed to recall the argument, it was written on fresh tablets and given into safer keeping. But when it was wanted it was found that the wax was broken to Pieces. Anselm with some difficulty put the fragments together and had the whole copied on parchment for greater security. The story sounds like an allegory of the fate which awaited this famous argument, which was lost and found again, pulled to pieces and restored in the course of controversy. Rejected by St. Thomas and his followers, it was revived in another form by Descartes. After being assailed by Kant, it was defended by Hegel, for whom it had a peculiar fascination — he recurs to it in many parts of his writings. In one place he says that it is generally used by later philosophers, "yet always along with the other proofs, although it alone is the true one" (German Works, XII, 547). Assailants of this argument should remember that all minds are not cast in one mould, and it is easy to understand how some can feel the force of arguments that are not felt by others. But if this proof were indeed, as some consider it, an absurd fallacy, how could it appeal to such minds as those of Anselm, Descartes, and Hegel? It may be well to add that the argument was not rejected by all the great Schoolmen. It was accepted by Alexander of Hales (Summa, Pt. I, Q. iii, memb. 1, 2), and supported by Scotus. (In I, Dist. ii, Q. ii.) In modern times it is accepted by Möhler, who quotes Hegel's defence with approval. It is not often that a Catholic saint wins the admiration of German philosophers and English historians. But Anselm has this singular distinction Hegel's appreciation of his mental powers may be matched by Freeman's warm words of praise for the great Archbishop of Canterbury. "Stranger as he was, he has won his place among the noblest worthies of our island. It was something to be the model of all ecclesiastical perfection; it was something to be the creator of the theology of Christendom — but it was something higher still to be the very embodiment of righteousness and mercy, to be handed down in the annals of humanity as the man who saved the hunted hare and stood up for the holiness of Ælfheah" (History of the Norman Conquest, IV, 444).